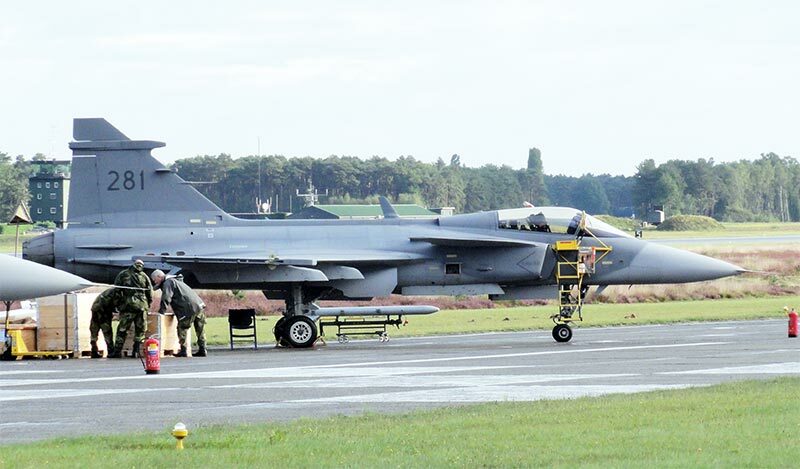 Swedish Gripen photographed by me at Kleine Brogel (B) Sept 2017. 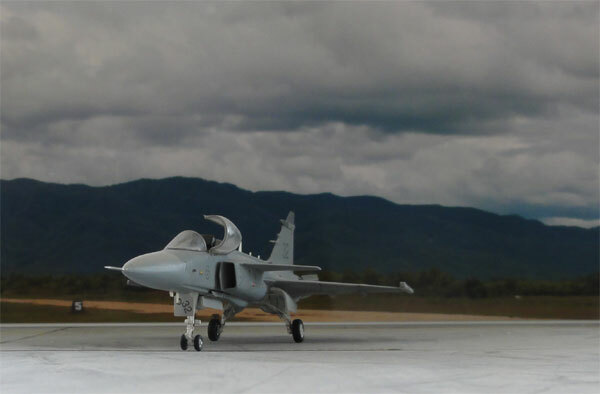 The JAS-39 Gripen is a fighter developed by Saab of Sweden as replacement of the Viggen and Draken. 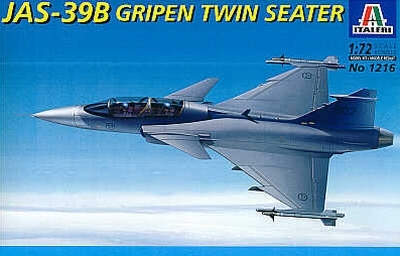 The Gripen has a single Volvo RM12 engine, delta wing and canards and has a top speed of Mach 2. It is relatively small but can carry many different weapons on underwing pylons. It is fully fly-by-wire. 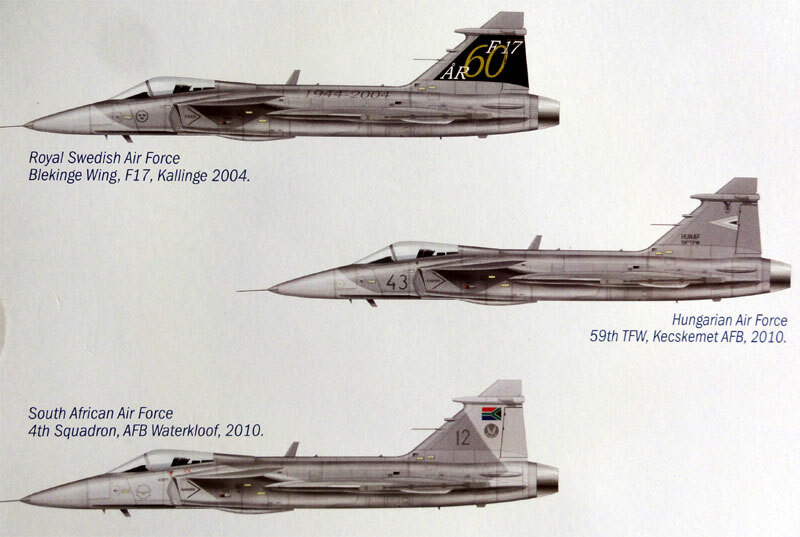 First flight was in 1988 and it came into the Swedish Air Force service in 1997. 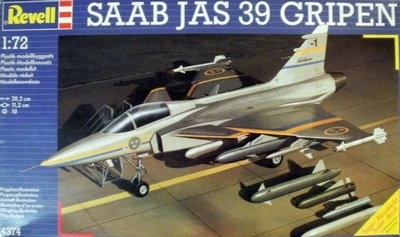 Several Gripens were also sold many years later for export to Czechia, South Africa, Hungary en Thailand. 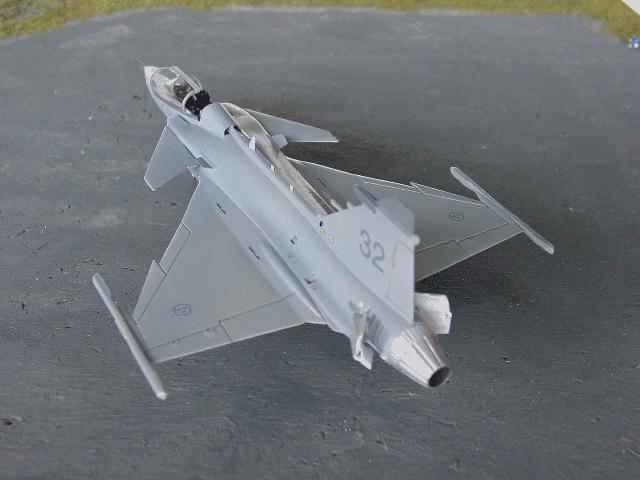 Over 250 Gripens have been built. A new version is now under development, the J-39E/F which is in fact a much newer generation aircraft. Brasil has signed a contract. 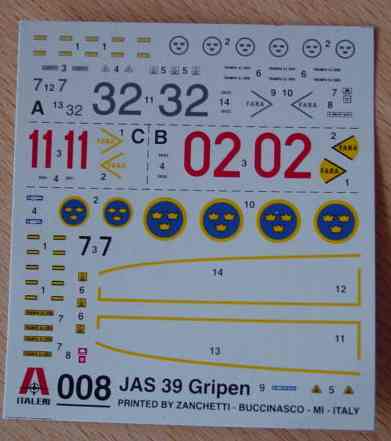 The Italeri Gripen JAS-39A kit #008 has about 80 parts in the usual Italeri style with good but soft plastic and clear instructions. The surface details are quite accurate and the dimensions are correct. Stores included with the pylons fuel tanks, Sidewinder missiles, Mavericks and it seems an ECM pod. The gunpack is a separate part. The kit also has been issued by Revell with kitnumber #4611, but both are still single seaters. The only difference are the decals. 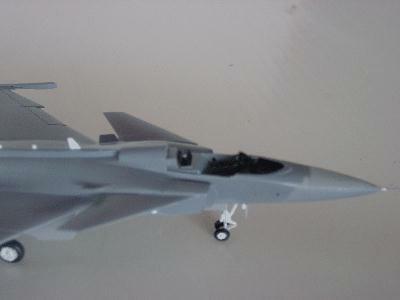 (do not confuse it with the later Revell kit #04999 issued in 2014). 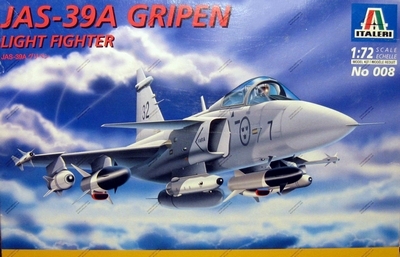 Whereas Italeri has the original blue Swedish roundels as fitted to the first Gripens, the Revell kit has not. Both kits also supply the toned down black roundels, but the diameters of roundels in the Italeri kit are not the correct size and shape, contrary to the correct Revell one's. 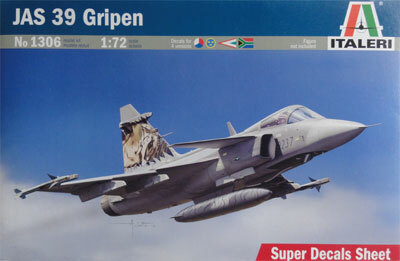 The kit should not be confused with the very old Revell kit of the Gripen, released way back in the nineties. This was very inaccurate, the box art seen below. 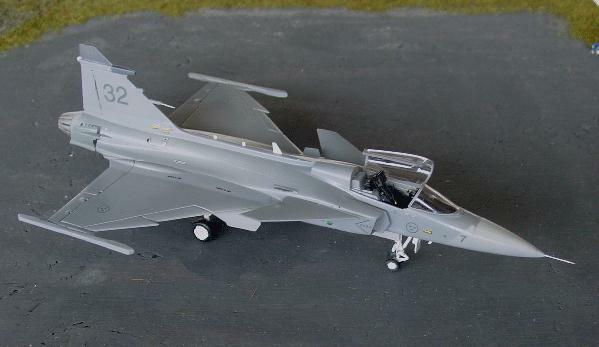 Revell did not have access to accurate information at the time, the Gripen still being quite a sensitive project. - The nosebay and cockpit tub must be carefully centered in the forward fuselage as otherwise they will not be symmetric. - The wings are best glued first to the fuselage left and right part, so do not cement the lower wing part yet. Carefully trim the upper winghalves with sandpaper and try to get a good fit. 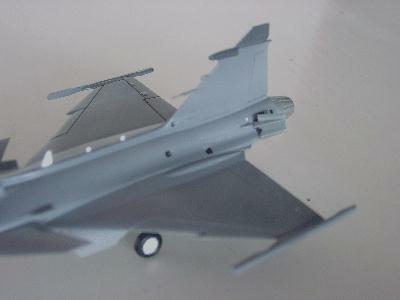 This will prevent a large gap later between the upper wings and fuselage. - The intake splitterplate #21A on the right side has two edges moulded on, the left one #23A not. Slightly remove some material from the edges of #21A and add two small edges on #23A. This will enable you to get a good fit of the intakes on the fuselage. - The nose cone requires filling with ballast and carefully assure correct assembly; up and down are different here. Also add the nosepitot, fill and sand. - All the pitot tubes are best cut-off and replaced by metall needles. 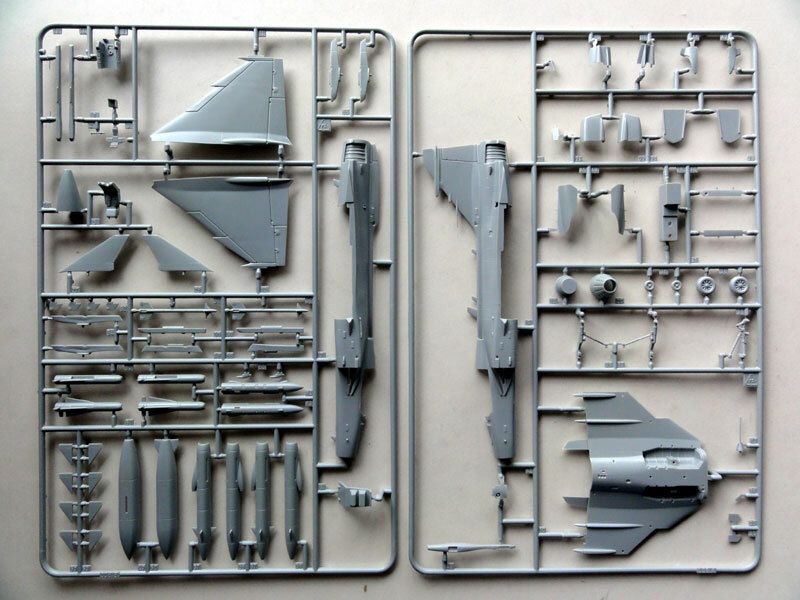 Finally, the kit requires slight amounts of filler at especially the intakes, the lower fuselage-wing joints and the fin to get it all right. Overall, nice kits to built and not be to missed by Swedish AF enthousiasts. 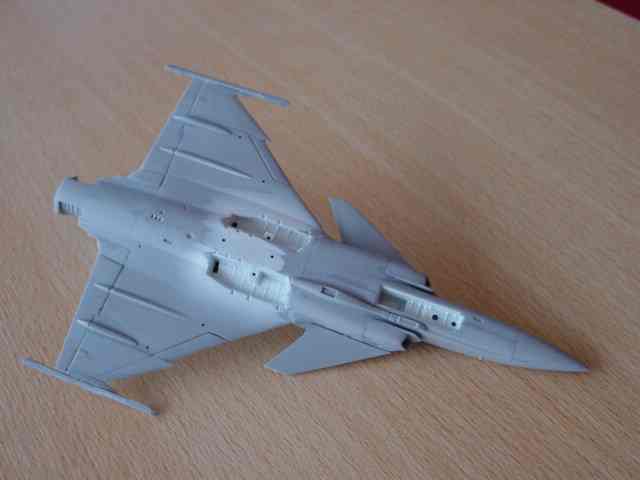 The Gripen model now was to being painted. I saw somewhere that the official colours are according to the Swedish NCS1950 system SIS 5502-B and SIS 3502-B. I used these approximations as FS36373 (using enamel Humbrol Hu34) for the lower areas and FS36173 (using Hu156) for the rest (upper). Masking was done with some tape. 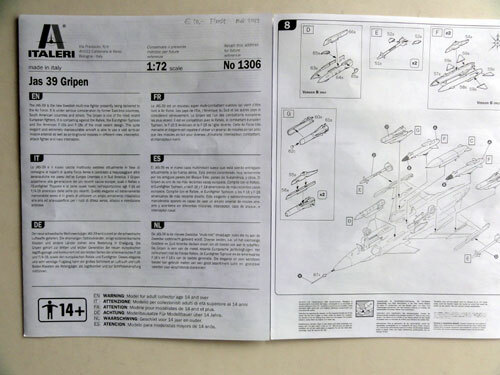 The reference color charts of Urban Fredricson of IPMS Sweden were used. The model is now complete. 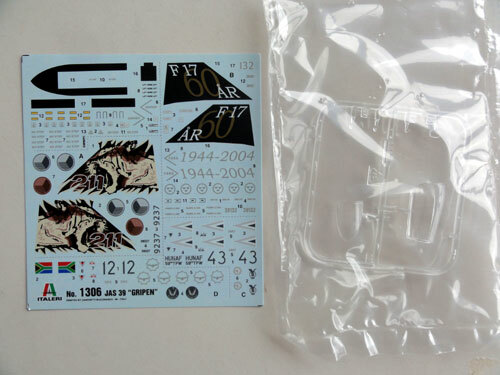 The excellent decals as provided in the kit of a service aircarft are used. Later on, Italeri did a re-issue with kit #1306 in about year 2011. Note: Czech scheme not shown. There are slight variations in the grey schemes. I am not sure if the Fed.Std FS colours stated in these Italeri instructions are correct. 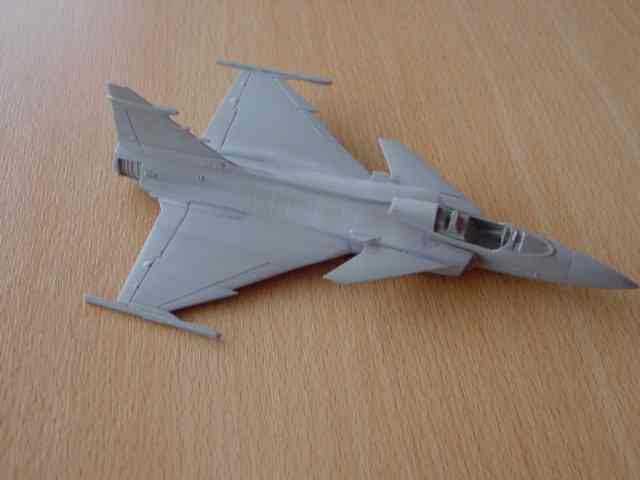 For example, the Swedish AF colours are very different as stated in the Revell instructions. Needs further investigation when the kit will be build. - length of the tailcone; the resin kit being (incorrectly) not long enough (5mm). - The intake shape needs correction. - The details on the kit as not as good as for the injection kit. 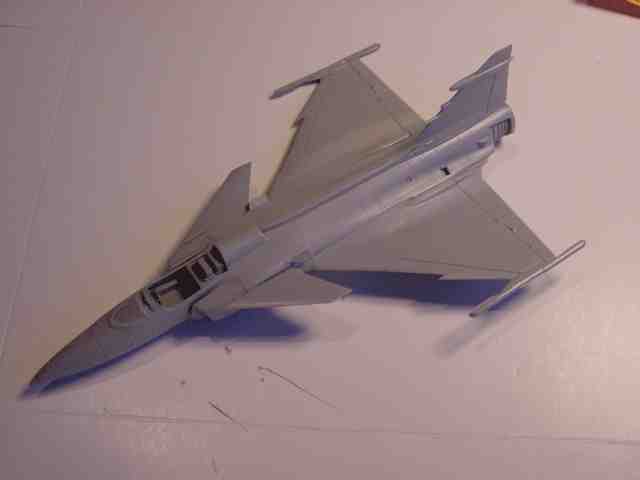 Cross-kitting it with the Italeri/Revell kit is very difficult as the part breakdown is very different. It is therefore recommended to correct theresin kit in detail and to built it on its own. - Air international vol 75, page? special. - World Air Power Journal , volumes 20 (pages 30-50) and volume 42 (pages 60-100).